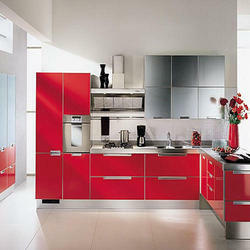 Leading Manufacturer of modular kitchen from Noida. We are listed at the apex for manufacturing and exporting Modular Kitchen. We make use of high quality wood and plywood and hence assure quality of the products to our clients. The counter top material is inclusive of artificial marble, artificial granite and artificial quartz as well. Moreover, conceding to the diverse demands of the clients, we offer customization as per the requirements of our clients. Looking for Lacquered Gloss Kitchen ?